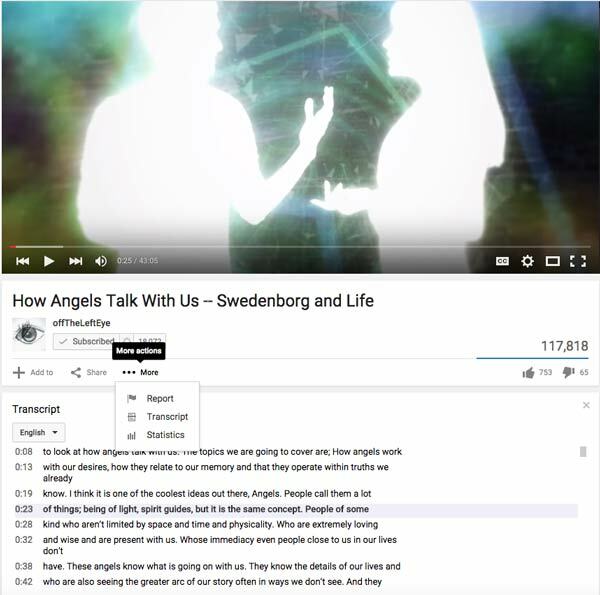 Thanks to a volunteer effort, we now have transcripts that serve as captions for some of the most popular episodes of Swedenborg and Life. The weekly webcast appears on the Swedenborg Foundation’s offTheLeftEye YouTube channel, where new episodes are streamed live at 8 p.m. Eastern time every Monday night; every episode remains on the channel for viewers to watch later. Transcripts of select episodes were produced by an all-volunteer group including Jon Childs (father of show host Curtis Childs) and Swedenborgians in Australia, allowing viewers to read along with what’s being said. The Australian effort was initiated by Michael Chester, director of the Swedenborg Centre in Sydney, with the transcription work done by Ellie and Joe Vandermeer of the Swedenborg Association of Australia. The first episode they worked on, “How to Deal with Evil Spirits,” was the basis for a talk hosted at the Swedenborg Centre, and they gave copies of the transcript to attendees as well as sharing it with the Swedenborg Foundation to use online. Three episodes have been transcribed so far: “Who or What is Jesus?” “How to Deal with Evil Spirits,” and “How Angels Talk with Us.” More episode transcriptions are planned, as well as transcripts for some of the shorter videos on the offTheLeftEye channel. To access these transcripts, go to the video page (for example, by clicking the link in the episode titles above). Underneath the “Subscribe” button, click on the “More” menu. If a transcript is available for that episode, you will see “Transcript” available as a menu option. When you select that option, the transcript will display below the video and automatically advance as the video plays, so the current dialogue is always bolded. If you enjoy the videos on offTheLeftEye and would like to volunteer to help with the transcriptions, we’d love to have you! Just e-mail info@swedenborg.com for more information.